Where Brooklyn at? Producing pizza, pastrami, and Jay-Z, Brooklyn houses an extensive supply of culture, history, and hipsters. During this Brooklyn Neighborhood Tour, you can discover what makes Brooklyn a truly unique piece of NYC. Traversing the borough, you'll visit Prospect Park (Brooklyn's answer to Central Park), the Botanic Gardens, Park Slope, Brooklyn Heights, film locations from The Godfather, and the best view of Manhattan. Considering Junior's famous pastrami sandwich and cheesecake are on the menu for lunch, this tour's an offer you can't refuse. Note: Exact meeting location will be provided upon booking. Tickets are non-refundable and cannot be rescheduled for an alternative date. Late arrivals and no shows will not be refunded or rescheduled. Great day, wonderful tour, recommend ot! Pizzas were delicious. Brooklyn is truly transformed into its former glory. Movie clips shown on tour were well timed and added to the fin. Thanks Tony for a very enjoyable day. All around great time. Tour was great, guide was great, pizza was great. When first looking for a tour it looks expensive, but I thought it was well worth the $. We chose this tour because it sounded like fun and we love trying food in the places we visit. Paula was our guide and she really brought the neighborhoods and places we visited alive. The pizza was delicious and the sights were interesting and fun. The television screens on the bus played scenes from movies that were shot on location as we passed by them. It was experience we all enjoyed and worth the price. I'm looking forward to the other tours this company has to offer and would tour with them again. Great guide. Good itinerary. Fabulous pizza. I'm from Brooklyn and she knew history and the current scene. I'd go again. Our guide was funny and thoughtful, spoke clearly, interesting, and very friendly. funny, interesting, well thought out and presented. Clips of movies when we arrived at filming spots was genius and made the fact real. SO MUCH FUN. Never knew pizza it could be so fresh tasting and unsalty and greasy. GO ON THIS TOUR. If you like movies, pizza, great tour guides, and Brooklyn, and who doesn't--then by all means go on this tour! Our slices of pizza, an over view of Brooklyn and taking a walk on the Coney Island boardwalk was a real treat. We are always looking for something different to do when visiting NYC and this tour accomplished that! I would recommend any activity that this family owned business offers, they are in it to win it. Paula was our guide, sharing inside secrets, movie trivia and the love of showing the group a good time. We look forward to our next annual trip and seeing what new adventure this company will be offering. Paula our tour guide was wonderful, charming and hysterical! She knew the neighborhoods and gave us a great tour and history of her favorite Borough. The food was great, both restaurants had great pizza and no waiting! As soon as we arrived at the establishment, we had pizza within 5 minutes! about a 4 1/2 hour tour and it was a highlight of our trip to NYC. Would definitely recommend! Guide was fun. Explanations were good. This tour was the best way to experience the culture, history and great food in Brooklyn. Our tour guide was a true proud Brooklyner with the funny sassy attitude to go with it. Lots of fun and a great way to see Brooklyn in a whole new light. LOVED it! We met our tour guide, Paula, around Union Square in Manhattan, 15 minutes before we departed for Brooklyn. She checked us all in & then we hopped on board an extremely nice & clean tour bus. Paula, our tour guide, was very informative, funny in a sassy kind of way (but its all good!) and could not have been more friendly, We LOVED her! The history of many Brooklyn neighborhoods we passed thru was told to us by Paula as we rode from one place to the next. Two awesome pizzerias, both very different from one another, was the main feature. 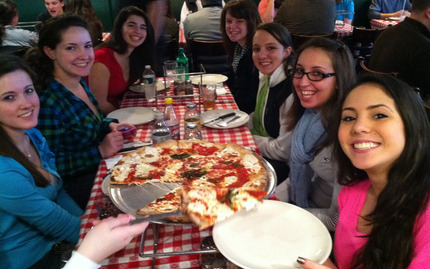 The first, Grimaldi's, we were served a margherita pizza, which I thought was phenomenal! The second, L&B Spumoni Gardens, we were served the Sicilian pizza, which was tasty & very filling. But save room for some homemade Spumoni! YUM! We also made a couple of stops for some photo opps. The first stop was at the Brooklyn Bridge park for some beautiful shots of the Manhattan skyline. At the end of the tour, we stopped at Coney Island for a stroll on the broadwalk and more photo opps. I have not one bad thing to say about this tour & I would most certainly do this tour again. HIGHLY RECOMMENDED! Booked the pizza tour as something a bit different to do while in New York that showed us a different neighborhood and also provided some tasty food. The tour over delivered in every way. Our tour guide for the day was the excellent Paula, a seemingly stereotypical Brooklyn girl in that she could talk the back legs off a donkey, knew all there was to know about Brooklyn and was very proud of where she was from. The actual tour was done by coach and took us into Brooklyn with commentary on the way. Every so often we would see video clips of famous movies on the screens in the coach before actually seeing the location out the window which really put them into context. At each pizza restaurant on the tour we got two very big slices, and at each place there was always extra for the bigger eaters. Both types were very tasty, I wasn't hungry afterwards. I can thoroughly recommend this tour and if back in New York will definitely check out some more of Brooklyn. One of the best tours I've been on in a long time. Paula was the perfect tour guide an absolute doll! She knew everything there is to know about Brooklyn and kept the tour entertaining and fun. Very down to earth person. Bringing the personal touch with the inside stories of Grimaldi's, the Verazanos Bridge, and even her own inside stories made us feel less like tourists!! The pizza stops were great as well. Can't wait to come back and do a pub/bar tour with you guys!! The tour was a hoot. As someone who knows Brooklyn only from literature and movies, the tour threw it all into perspective. Tony, the company owner, has great passion for his hometown and knows his history. He was quite pithy. He also interspersed the tour with clips from various Brooklyn movies. Even more impressive was the fact that Tony was a last minute substitute on our tour. His cousin, Paula, was the initial host. She was taken ill during the first leg of the tour and he jumped in seamlessly while she was taken for medical attention. The pizza and the 2 places we went to was excellent. But the tour was to short. I would much rather combine this tour with the Brooklyn neighborhood tour and make it an all day tour. The people, tour guide, bus driver were all very friendly. Thank you for showing some of Brooklyn. I brought a visiting Midwestern friend and his 17 year old daughter, who wanted to see Brooklyn. Fun, relaxing way to see different areas of the city and enjoy some fabulous pizza at the same time. Paula, our guide, did a great job. Can't wait to try Tony's neighborhood tour now. Very informative, tour guide was FANTASTIC and the pizza was out of this world! It was great watching scenes from movies on the charter bus and then seeing the real locations. Genius! My sister and I took a trip back to our childhood memories....Places we have not seen in over 40 years seemed like yesterday. It was the best day spent with Tony the most enthusiastic Tour Guide you will ever find. He not only told you the facts....but had videos to back them up. There was no stone left unturned and by the end of the day it was like going through the old neighborhood with your Cousin. Highly recommend. "BROOKLYN FOREVER"
We saw areas of Brooklyn, which we would never have seen walking around on our own. Tony gave us a lot of information on Brooklyn and its neighborhoods. Will do the Pizza tour next time.